Ultimate versatility is what the Newhouse LED Flex Clamp Lamp is all about. With a strong clamp holding it in place, the Flex Clamp Lamp provides bright, usable light right where you need it. Top uses include clamping onto dorm room furniture, or as the perfect bedside reading light. We know you will enjoy it's flexibility and come up with some great uses. As with all of our lamps, it uses the latest in LED technology and delivers quality light while being extremely energy efficient. Make the switch to LED today. Make mother nature proud. Newhouse Lighting NewBright Technology provides full spectrum lights & no ghosting, thus offering a more natural lighting experience. The bright warm 3000K LED light bulb paired with the Smooth Illuminating Diffuser will keep eye strain at bay so you can keep reading, working, or studying with minimal pain or exhaustion. Easy to reach power switch located along the lamp cord. Get light where you need it, exactly when you need it, without any surprises or wandering in the dark. 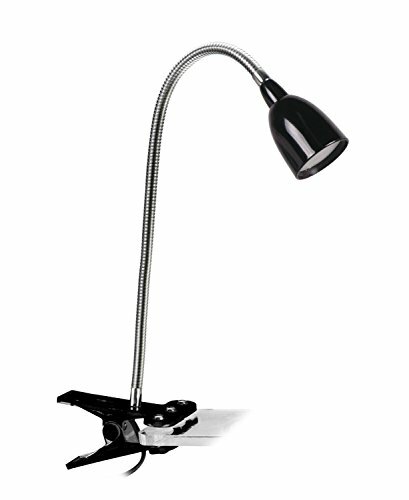 This versatile desk lamp comes equipped with a multi-purposed gripping base. The suction cup grip creates additional support for smoother surfaces while you pull and bend the neck to cover any angle you may need. The clear choice for a student, a professional on the go, a mechanic, or anyone who desires a portable energy efficient light that will never burn out. Newhouse Lighting is focused on manufacturing and selling sensible and stylish energy-efficient LED lighting products. Newhouse Lighting provides quality lighting while using a fraction of the energy most of today's lighting products consume. With over 100+ years of combined lighting experience, the team at Newhouse Lighting tirelessly works around the clock to come up with new and function-rich LED lighting products. We believe in doing our part to a more sustainable future, therefore we offer free recycling to any of our NewHouse Lighting lamp products. Please contact us for more information. The highest quality energy saving LEDs provides efficient non-flickering natural warm light for stress free productivity and enjoyment. Great for all age groups, girls, boys, kids, teens, and adults alike with 3 color choices (black, blue & purple). Comes with super long life LED module (up to 30,000 hours) that never needs to be replaced (1-year warranty against manufacturer defects).